We will never stop admiring the beauty of a high-end product, but our salary doesn't always accommodate the luxury price tag. (Psst-we know a few designer-like pieces you can actually afford.) However, if there's one thing every insanely stylish room has in common, it's the high/low mix. The old adage rings as true in interior design as it does in all other aspects of our lives: Too much of a good thing will throw off the balance. Athena Calderone, an interior designer and the founder of EyeSwoon, agrees. Too many iconic pieces in one home can appear fussy or overstyled. "The goal when I approach a space is to ensure there's a mix," she told MyDomaine. "A touch of sophistication with something that has an edge. So that means pairing something slick or smooth with an element that is rough or has that timeworn patina, a bit of grit with a whole lotta glam. I always ask myself, Where can I add more or where can I restrain? It is in that clash, the opposition, the high and the low that truly makes a space your own." With that in mind, we tapped Calderone and six other interior designers to show us how they would elevate every room in the house with only $150 at IKEA along with their IKEA décor ideas. Get ready to add to cart! The living room needs to be relaxing, but it also needs to provide a hint of elegance to showcase our style. Calderone often turns to the Scandinavian retailer for inspiration. In fact, she has many IKEA pieces in her own Amagansett home, including the popular Malm bed. Here's how she would spend $150 at IKEA to refresh one of our most-loved spaces. Spoiler alert: Calderone went over her budget by $13, but we can't blame her, because these products are totally worth it. "This was my big splurge, as the black anchors the room and ensures the lamp is a standout piece, almost in a bold, architectural way. I love the touch of brass details that elevate the overall design," Calderone says. "Nothing screams cozy like a shearling rug draped over a chair, sofa, or even on the floor. It adds softness to any space," Calderone says. "Okay, so call me crazy, but does this rug pad not look like a felted wool rug?" Calderone says. "I love to get crafty and use items for alternate uses, and I would argue that this pad can look incredibly chic with its melange of gray tones as an actual rug." "I love myself some nubby linens, and I have been obsessed with hemp as of late. We all need a neutral, textural, and tactile throw draped over our sofa and this throw fits the bill on so many levels. I love, love this. It has great texture and looks super cuddly," Calderone says. "I would argue that you always, always need to incorporate natural materials into a space. I love to bring in some contrast by incorporating more rustic, woven materials. It's all about the yin and yang. This will help to transform a room," Calderone says. "You can stack books or magazines in this basket or fold up extra blankets and pillows. It would also make an amazing vessel for a large potted plant." "You can't go wrong with a $7 pillow. I love the haphazard pattern. It certainly adds edge to the room. If I had more budget, I would like to throw another colorful pillow into the mix to pair with it." "There is nothing I love more than bringing a bit of the natural world into a space and playing with composition. A simple glass vase can add a vertical element with a sculptural quality to any room. Just add a few tall branches," Calderone says. It's where we convene with our family and friends to enjoy one of life's most cherished hobbies: eating. Similar to the living room, your dining area should have a laid-back and relaxed aesthetic with an elevated touch for those nights when you invite a few friends over. Here's how New York-based interior designer Brett Beldock of Brett Design would spend her $150 at IKEA. "This side table is double-tiered, making it perfect for serving. It's like a Parsons table with an extra shelf," Beldock says. "The natural stools in a dining room setting offer a pop of fun and their wooden frame relates to the table too," Beldock says. "I would style two of these hanging shades over the dining table. They are also light and open, so their shape relates to the backs of the dining chairs," Beldock says. "This bowl is simple and handsome. It calls to the natural and white colors of the table too," Beldock says. As the heart of the home, your kitchen deserves to be given the royal treatment. This is where we spend most of our time (other than our beds, of course) so simple yet stylish updates are necessary to ensure this space is where you want to hang out. This is especially important for those of us who don't enjoy cooking as much as our foodie friends. Below, Laura Burleson of Laura Burleson Interiors shares the IKEA pieces she'd buy with only a $150 budget. "I love how swapping out predictable hardware for these sleek, minimalistic handles can change basic cabinetry from ho-hum to design-forward in one simple step," Burleson says. "These shelves are intended for floor-based installation, but at 55 inches high, they can easily be repurposed into gorgeous open shelves on a countertop, even in lower-ceilinged homes," Burleson says. "I especially love that with the galvanized metal, you can easily paint or powder coat them any color for an even more custom look. Who needs boring upper cabinets when you can have a custom shelving look for so little?" "Interspersing attractive baskets on open shelves allows the homeowner to hide unsightly items while adding a bit of visual uniformity among the busyness of stacked plates and glasses," Burleson says. "This pendant's creative design belies its inexpensive price tag. Its sleek modern vibe allows it to adapt easily to any surrounding décor," Burleson says. When it comes to our favorite space to decorate at home, it's the bedroom, hands down. How you design the boudoir can positively or negatively impact your slumber. If it's the blissful and dreamy variety you're after, then be sure to follow Homepolish designer Tali Roth's advice. Enter the sandman. "A bedspread is such an important tool in creating a distinct look in your bedroom. It's an opportunity for some wild textures or strong colors. I particularly love pairing a bedspread with simple soft whites or gray linens, as they can completely transform a look. This inky blue bedspread is so bold, but the color is so calm and soothing. While it's rich, it's also casual and cool, which I love in my bedroom designs," Roth says. "I am completely obsessed with this khaki tray table. The slim profile together with the removable tray is both aesthetically pleasing and practical. I would pair this with a second side table and create a nesting table set OR simply use it on one side of the bed against an existing nightstand. It blends beautifully with woods, brass, creams, and grays, and while it's a color, it reads as a neutral. I love its sleek contemporary look, and again, the coloring is very soothing," Roth says. "I love the Fado lamp, as it gives off the most beautiful soft ambient light, and in many ways, it seems like a sculpture rather than a traditional light. The Fado plays well with other lighting pieces and more traditional shapes, and that is why I have chosen one to place on the Gladom table. There is something sky- or cloud-like about this light that immediately induces a state of calm, which is so important for the bedroom," Roth says. "I like to use art in the bedroom as an anchor, and I prefer to choose pieces that are more abstract or subtle, " Roth says. "But if you're in the mood to spend a little more, this one is also beautiful and inexpensive." "This black and white frame is classic and suits any poster, art print, or children's artwork," Roth says. When you need to soak away a stressful day or just want to prime and prep yourself for a night out, the bathroom is where we seek that solace and unwind. To make sure this room really is that place of rest, we tapped Portland, Oregon-based interior designer Max Humphrey to show us how we can give it a refresh with only $150 at IKEA. "Storage is everything in a bathroom, especially in smaller spaces and rental apartments. This rolling utility cart is perfect for overflowing accessories, necessities, or towels that don't fit in a vanity or medicine cabinet. I dig the industrial metal vibe too," Humphrey says. "Every apartment I've ever lived in has come with lame light fixtures. A quick and cheap fix is to swap out the existing pendant lights and sconces, and the cool thing is you can just swap them back when you move out. Loving these cheeky, pill-shaped wall lamps either above or flanking a vanity mirror," Humphrey says. "You can never have too many bath towels, especially if you have visiting houseguests, but stocking up can take a toll on your wallet. The Frajen series is a steal and they come in a million fun colors like pink, green, and gray, and, of course, white. A bonus is that you can get washcloths, hand, bath towels, and bath sheets in each color," Humphrey says. "Another quick upgrade is to swap out your bathroom mirror with something more decorative. I always used framed mirrors in my design projects, and this guy with the exposed wood edge is on trend. It's cool that the frame has some depth to stash a bottle or toothbrush holder if you're stuck for counter space," Humphrey says. "Another on-trend storage solution is this bamboo bathroom dish set. It's perfect to organize and hide your unmentionables, or at least a batch of cotton balls and Q-tips," Humphrey says. "A lidded trash can is another must-have in a small bathroom. The off-white and satin metal-mixed finish is super cute and goes with any style space," Humphrey says. While our common areas are kept up-to-date or refreshed seasonally, the home office is often overlooked. Whether you work full-time at an office or you're an entrepreneur at home, this space can be utilized for so much more than work. It's also a place for you to write letters, do research, and compile your thoughts without the distractions from the other rooms. Here, Dorianne Passman of Thea Home shares her top IKEA picks to spruce up your office space on a budget. "Task lighting is always important. Even though we do a lot of work on our computers, good lighting is key when you want to work with other materials or write notes. We think this one is super cute with the brass details," Passman says. "Organizing is key. Our pet peeve is having papers lying around. The key to creativity and productivity is to have a clean space. You can tuck your paperwork and magazines in these cute storage bins. The best thing about them is that you can paint them any color you want," Passman says. "A floating shelf in a home office is a great addition because it clears some items off your desk. The more free space you have, the cleaner everything will feel," Passman says. "Hiding your cables and wires is important. Declutter in any way you can. This cork detail is super cute too," Passman says. 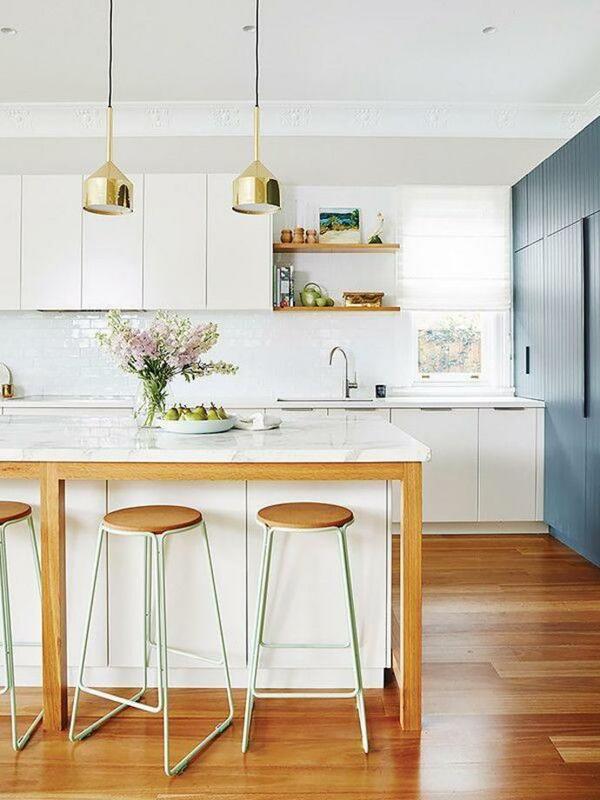 "We love this bin take on the old-school garbage pale because it has so much character. It also has a lid to hide your trash," Passman says. If you want to make a grand welcome, then your entryway is the space to do it. Don't underestimate the power of a good doorway. It's the perfect greeting and not only for your guests either. This is your reminder that you've returned to your happy place at the end of a long day. There's no greater feeling. Olivia Korenberg and Jenn Pablo of Twofold L.A. show us how you can make this special space feel like home with less than $150 at IKEA. "An entryway is an introduction to your home and therefore a great place to showcase art and photographs. We like the clean white Ribba frame as it can be hung horizontally or vertically and comes with a mat, which allows the art to breathe while also helping the framing feel a bit more formal," Korenberg and Pablo say. "The grayish nature artworks are great pieces to add a bit of neutral color to an entry. We envision these hanging side-by-side above the Ekby Osten wall shelf or one on top of the other by a door opening," Korenberg and Pablo say. "The Ranarp pendant would be a perfect light for an entry. We love the matte-white finish, the black-and-white cording, and the pops of brass on this piece. It has a somewhat indoor-outdoor appeal to it, which would go well in a transitional space," Korenberg and Pablo say. "An entryway needs to be functional and well-organized. We like that this hook is simple, which helps it be discreet and blend into walls. It only has one hook, which limits how much can actually be displayed, keeping the look clean and unfussy," Korenberg and Pablo say. "These boxes are great for storing keys, change, and other odd bits not worthy of displaying. We love their handmade appearance and functionality," Korenberg and Pablo say. "When space is tight, we like to implement small profile floating shelves like the Ekby Osten. It can be used as a key and mail drop in addition to displaying small objects or fresh flowers," Korenberg and Pablo say. "This doormat has a clean, fun and youthful feel. The friendly price point makes it easy to swap out if they become damaged or stained too," Korenberg and Pablo say. This post was originally published on January 12, 2017, and has since been updated.